Two cruise ships ran into trouble in different parts of the world this weekend, but no injuries were reported. The Bahamas Celebration, which operates two-night cruises between the Port of Palm Beach and Grand Bahama Island, has cancelled all departures for the first two weeks of November while the ship undergoes repairs after striking an unidentified object. The 16,000-ton ship, built in 1981, hit something underwater at about 9 p.m. October 31 after departing from the Bahamas. 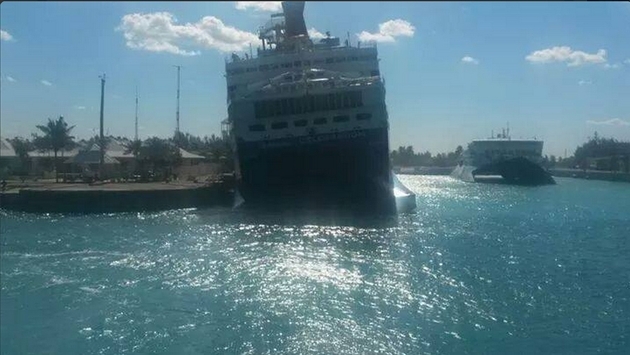 Passengers were asked to put on life jackets as the ship returned to Grand Bahama Island. “No passengers were ever in any danger and everything was handled in an organized and efficient way by ship, corporate, and Bahamian personnel,” Celebration Cruise Line said in a statement. The 960 passengers were put up in resorts on the island and were returned to Florida on Saturday night by Resorts World Bimini’s SuperFast, a ship that regularly operates cruises to Bimini from Fort Lauderdale and Miami. Celebration Cruise line said it will notify passengers on the cancelled cruises and either provide refunds or make other arrangements. Meanwhile, Cruise & Maritime Voyages’ classic ship Marco Polo was briefly stuck in a mud bank near Leknes in Norway’s Lofoten Islands. No injuries were reported by the 763 mainly British passengers, who were still allowed to go ashore to Leknes via tenders. As the tide rose, the ship eased off the mud bank and resumed its 14-night “Norway and the Land of the Northern Lights” voyage. “The comfort and safety of our passengers is our top priority and our passengers have been kept fully updated of the situation,” said John Dennis, vice president of CMV USA.